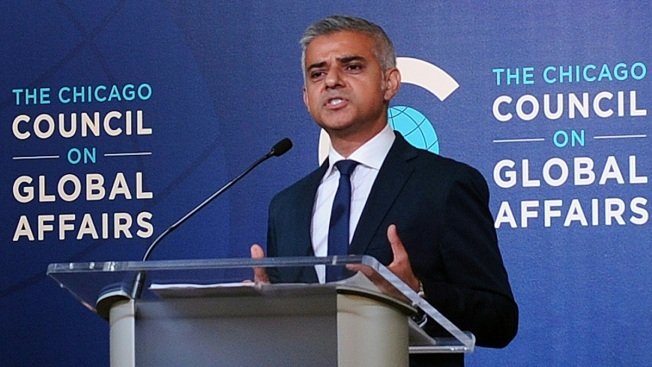 London Mayor Sadiq Khan speaks at The Chicago Council on Global Affairs on Sept. 15, 2016, during a trade promotion trip to North America. Sadiq Khan is using his first trip to the U.S. since becoming London's first Muslim mayor to criticize Republican presidential candidate Donald Trump. The Chicago Tribune reports Khan said Thursday evening that Trump was representing the views of "extremists" when he said mainstream Muslims can't have Western values. Khan says he's a "big fan" of Democratic presidential nominee Hillary Clinton who should be "infusing, energizing people to vote" for her. Khan talked to reporters after speaking at the Chicago Council on Global Affairs, where he focused on social integration. The London mayor plans to tour the city Friday with Chicago Mayor Rahm Emanuel. The two are expected to stroll along the Chicago Riverwalk, visit a digital startup community and dine at the Art Institute of Chicago.